A broken ankle is also known as an ankle "fracture" means that one or more of the bones that make up the ankle joint are broken. A fractured ankle can range from a simple break in one bone to several fractures, which forces your ankle out of place and may require that you not put weight on it for a few months. 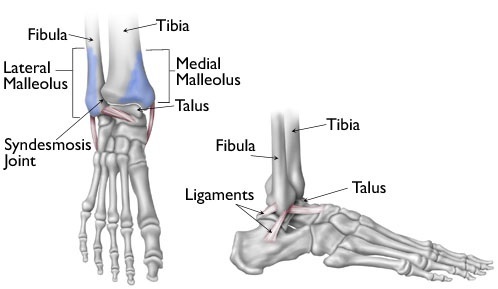 Damaged ligaments may also be part of an ankle fracture. Fractures and breaks may be caused by twisting, rotating or rolling your ankle, tripping and falling, or even impact caused when one is directly involved in a car accident. Common symptoms associated with ankle fractures may include, immediate and severe pain, area may be tender to the touch, area around the injury will be swollen and even bruised. Deformities may be present and visual to the eye. Someone with an ankle fracture may be unable to put any weight on the injured foot.